The openwork band of foliate design set throughout with circular- and single-cut diamonds weighing approximately 9.50 carats in total, decorated with carved rubies and emeralds, length approximately 185mm, signed Charlton. John W. Charlton opened his business in New York under the name of J.W.Charlton in 1909, later changing to Charlton & Co when Robert S. Chapin became his partner. In the 1920s, branches were open in Palm Beach and in Paris. In 1934, another partner Grant A. Peacock acquired ownership of the company, changing the name to his own. Charlton was known for creating some of the most important jewels of the Art Deco period, with an impressive client list equalling those of the biggest jewellery firms. 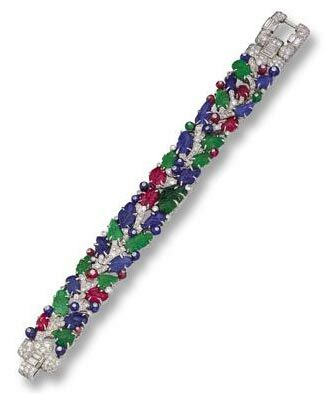 The wide, articulated strap designed in the Mogul style as a meandering vine pavé-set with single-cut diamonds, bearing a profusion of carved emerald, sapphire and ruby leaves, and berries formed of emerald, sapphire and black onyx beads, many of the beads inset with round diamonds, the vine further accented with buff-top emeralds and bands of black enamel, the sides enhanced with calibré-cut onyxes, mounted in platinum, length 7 1/4 inches, signed Cartier, Paris, numbered 32077, maker's mark and assay mark. With original fitted red leather case signed Cartier. 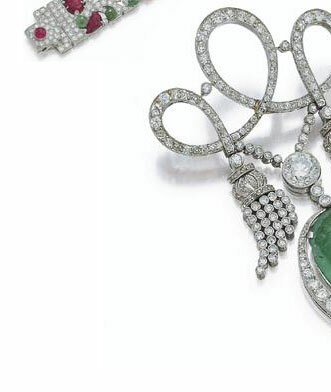 Cartier's Indian experience began in 1901 when Pierre Cartier was asked to create from various pieces of her jewelry, an Indian necklace for Queen Alexandra, Empress of India and wife of Edward VII. The necklace was to be worn with three Indian gowns sent to her by Mary Curzon, wife of Lord Curzon, the Viceroy of India. Indian decorative influence was pronounced in London because of its position as part of England's Empire and henceforth, it was Cartier's London branch headed by Jacques Cartier that handled the firm's Indian business. Jacques Cartier made his first trip to India in 1911, the same year as the Delhi durbar in celebration of the coronation of Georges V. It was during this trip that he consolidated his contacts with India's maharajahs, spending time with them at their palaces. This was to result in not only a long and profitable patronage of the firm by India's royalty, but also a distinctive influence that would inspire Cartier to new heights of creativity in the art of jewelry design. 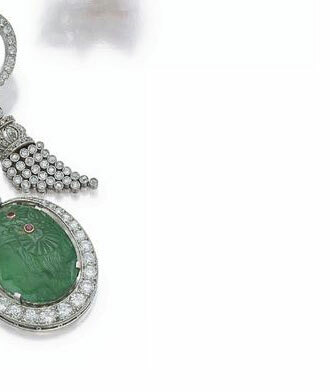 Interestingly, while the Indian princes were interested in having their jewels reworked in the European style, it was the traditional use of carved colored stones and enamel work, that inspired the oriental feeling that would characterize Cartier's Art Deco designs. The principal designers at Cartier, Jacqueau in Paris and Genaille in New York, managed to crystallize in their jewels the seemingly light airiness of delicate platinum workmanship with the floral themes that represent the fusion of Persian and Indian decorative motifs that define Mogul design. The stones they used in the pieces of this period were cut and engraved in naturalistic leaf, flower and berry shapes, seemingly attached to a pavé diamond stem, with diamonds inset into some of the "berries" as well as collet-set as accents. Known popularly as "fruit salad" and "tutti frutti," these jewels reflect the pursuit of the exotic that so captivated the sophisticated European and American collectors of the 1920's and 1930's. 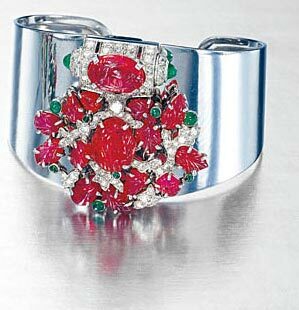 The bracelet above, is a spectacular example of les Indes galantes by Cartier. It was purchased in1930 by Mr. Roy D. Chapin, Sr., from Cartier, Paris, as a gift for his wife, Inez, on the occasion of the birth of their sixth, and youngest child, Marian. Mr. Roy D. Chapin, Sr. founded the Hudson Motor Car Company in Detroit and was a pioneer in the American automobile industry. It was on a trip to England and the Continent in 1909 for the purpose of learning everything he could about the latest European automobile designs and manufacturing processes that he met Jules Glaenzer, an extraordinary salesman for Cartier, New York, with an astute business sense and great charm. They met on board the ocean liner, Kronprinzessin Cecile, each having been given letters of introduction to the other by mutual acquaintances. They became fast friends during the trip with Mr. Glaenzer introducing Mr. Chapin to a number of affluent clients of Cartier's in Europe, the entertainment of whom was part of Mr. Glaenzer's job. Their friendship lasted Mr. Chapin's lifetime. Signature Cartier pieces such as this which represent a period of innovative design in western jewelry are very rare. (not signed items......) These jewels are miniature works of art and as such command an appreciative audience not only of jewelry lovers but of those who understand jewelry as art. 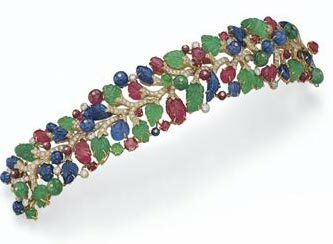 2002 Sotheby's auctioned of 933,500 USD for the carved, coloured stone and diamond 'tutti-frutti' bracelet by Cartier (above left) confirmed today's appreciation of jewellery as art, and also confirmed this Indian-inspired design as a classic. Examples of the firm of Cartier's introduction of Indian motifs into Western jewellery design abound. Jacques Cartier's fascination with India resulted from the choice of the Parisian firm by India's princely families  following the celebration of George V's coronation at the Delhi Durbar in 1911  to rework their jewels into what they perceived as more fashionable European styles. Cartier travelled to India that year, a distinctive influence that would inspire Cartier to new heights of creativity in the art of jewellery design. The colourful enamel work of Jaipur, Benares and Lucknow was mirrored in the juxtaposition of coral, black enamel and coloured stones in Cartier jewels of the Art Deco period. The traditional paisley motif from the sarpech and the hanging turah, both Indian turban ornaments, were incorporated into Cartier's version of the aigrette, as well as lapel and hat brooches, and the tassel pendant. The choker-like guluband and rigid collar necklace, hasli, were translated into stunning gem-set necklaces and bracelets. The pinnacle of Cartier's Impressionist artistry was in the creation of jewels reflecting the fusion of Hindu and Persian elements that characterize Mughal decoration, mirroring paradise on earth through colour and naturalistic motifs. Lightly set in platinum, utilizing sapphires, rubies and emeralds cut and engraved as flowers, leaves and berries, tipped by and interspersed with brilliant-cut diamonds, Cartier's 'tutti-frutti' jewels had an exotic, sumptuous quality that appealed to a Western audience captivated in a colonial age by the exoticism that they associated with all things 'Oriental'. 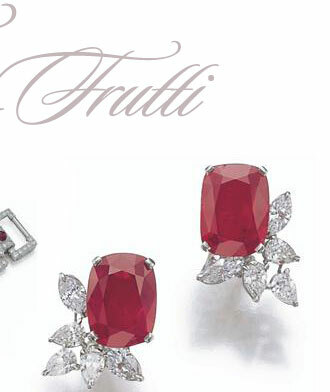 Manufactured between the early 1920s and late 1930s, a limited number of 'tutti-frutti' designs were produced, and each one was, and is, an original. 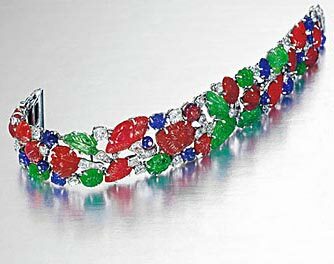 Cartier designers Charles Jacqueau in Paris and Georges Genaille in New York assembled the coloured stones acquired in bulk from India  some with small drill holes still visible from a previous decorative use  with an artist's sensibility. The design would be laid out and they would walk away, return with a fresh eye and make adjustments and walk away again, until each jewel finally attained just the right balance of colour and proportion . 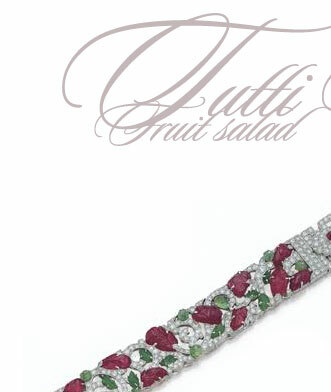 The 'tutti-frutti' jewels in a bracelet that gives full rein to the motif. The clips, paired, single and incombination with a polished cuff-bangle, exemplify the versatility of this Art Deco form, which can be adapted to suit the wearer. The combination of rarity and the thematic originality of these jewels make them well worth collecting, and their inspired decorative quality makes them well worth wearing  which in the end, is the whole point of jewellery.